Buying property is a great opportunity to make money. Unfortunately, it’s also an opportunity for disaster if you miss something big in the process. The following items are things to look for outside, before considering going inside. Do I LIKE the look of the property as I pull up to it? Do the neighbors keep up their properties? Does it seem like a nice neighborhood to live in? The house might be the worst one on the block. The gutters might be hanging down. The paint might be peeling off or shingles might be out of place on the roof. But overall, remember to ask yourself, what can I do to fix this problem, and how much money do I need to invest in the fix-up? What kind of siding is it? Does it need paint? Can it be painted? Learn the difference, because there are different ways to deal with problems on siding materials. Some are cheaper than others. If it is just rough looking, you could consider cutting out rot, replacing it with whatever non-rotting material you want to use. If you do need to paint the exterior, use a good quality paint, and do the job right the first time. Take note of the grading and what it looks like directly below the gutters and right up to the edge of the house where the dirt/grass/rocks meet the foundation. Does it look like there is a loss of dirt there from erosion? Is the problem the gutters? Look at them and see how they are connected to the house. Are there a lot of pieces that connect together, or is it a seamless gutter product? If it’s not seamless, replace them. Gutters are super cheap, and if not corrected, grading and foundation problems will occur later. This vantage point can also foreshadow what you will find inside in the crawl space or basement as far as potential foundation problems. Usually you can see right away what is going on with the roof. What kind of vents does it have? Tile, flat roof, composite shingle? What does the roof look like? Old, new, dirty? Does it look uneven? Get up there and touch a few pieces of the shingles to see how they move. If they are brittle or broken, it’s old and will have issues. 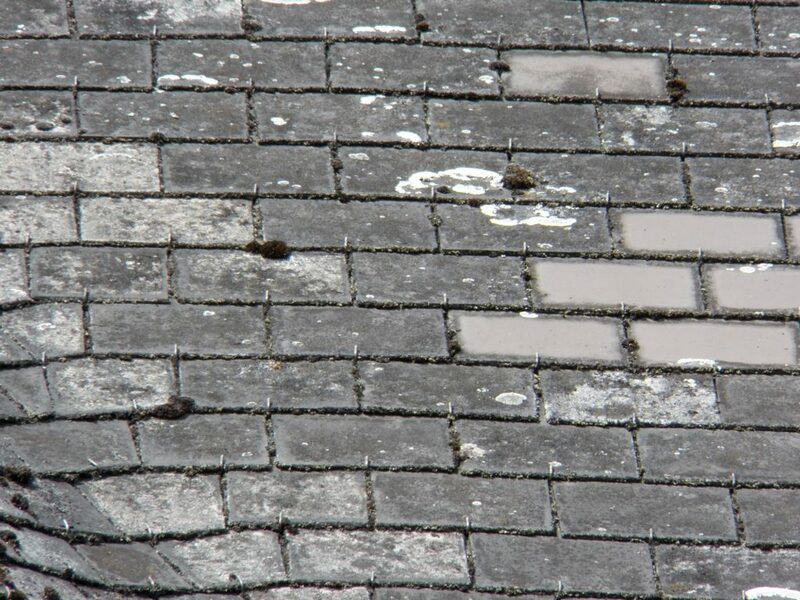 If it is a tile roof, usually you can replace a tile on the roof and just have the roof cleaned. Make sure that if you don’t know what you’re doing, hire a professional. On the outside of the house, usually you will have the mast that holds the electrical lines (if they aren’t buried underground). For older rental properties, nearly all of them have power lines that run from a pole to the house. Are the lines at an acceptable height above the ground? Does the meter box look new, is it the correct one required by the city? Is there anything rusting? What kind of condition is the deck in? Can you power wash it and use a deck stain on it? Does it have the proper support underneath? Decks are expensive. Make sure you check them out. Observe what the yard looks like. Do tree limbs hang low? Usually you can have these limbs trimmed and removed pretty inexpensively. However, If there is a tree that needs to be totally removed, it’s expensive. Seed and fertilizer on the lawn can be cheap, and huge game changer for the look of the property. By checking out the exterior of a home, an investor can get a feel for the property and if it will be worth looking into further.